Syringes and hypodermic needles are used daily within the dental practice. From single-use syringes for rinsing wounds to dental needles for local anaesthesia, we offer you a comprehensive assortment at affordable prices. Discover our wide selection of application cannulas. 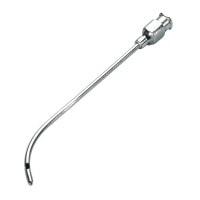 Find blunt cannulas in a range of sizes; with Luer connectors or metric threads, here. Order single-use cannulas with metric threads or Luer connectors, as well as disposal containers, here. Find sterile disposable syringes for injection, application or rinsing. 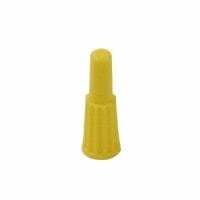 These disposable syringes with Luer or Luer-lock connectors are available in various sizes to suit your needs. 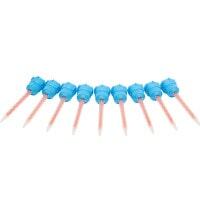 Irrigation cannulas are used to rinse wounds and periodontal pockets. Our button cannulas are available in either straight or curved forms, and as reusable or disposable cannulas. Here, you will find sharps containers in various sizes for the safe disposal of used scalpel blades, hypodermic needles and suture material. Mixing tips for precise dosing and bubble-free mixing with different automix systems. 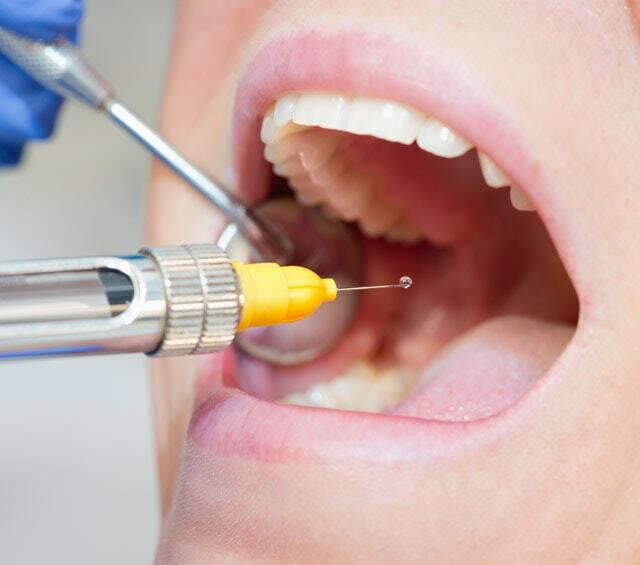 Syringes and hypodermic needles come into use within various areas of the dental surgery. Whether for wound irrigation, local anaesthesia, for applying ointments or for mixing impression material. Application cannulas are used for placing ointments and medications in wounds or gum pockets, for example. The blunt needle tip allows the medication to be applied anywhere without injuring the gingiva. Application cannulas are flexible and can input medication into difficult to reach spaces. Because of the various sizes, even thicker pastes can be applied. 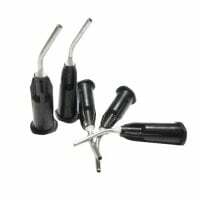 For pinpoint accurate application of etching gel or fluoridisation paste, special cannulas are required, which posses a high flow rate so that thicker material can be applied. Another requirement is that the opening is still fine enough to allow for exact pinpoint application. The single-use needles in this category are suited for dental anaesthesia and available in different sizes and lengths. Some of the single-use cannulas have a Luer connector and can be used with all common single-use syringes. For use with cylindrical ampoule syringes, we offer you dental needles with metric threading. This allows the single-use needles to be securely connected to the dental syringe. For precise dosing of wound irrigation solutions, gingiva pastes or for administering local anaesthesia within the dental surgery, single-use syringes are used. The syringes have a transparent cylinder with a scale, as well as a thick, smooth-running plunger for accurate dosing. The single-use syringes can be used with all common single-use and reusable needles with Luer connectors. For wound irrigation during and after jaw surgery, reusable irrigation cannulas are put into action. These irrigation cannulas have a blunt, rounded end and a Luer-Lock connector that allows for use with common disposable syringes with Luer connectors. Using your choice of a curved or straight cannulas, sodium solution or other medical solutions can be sprayed into the wound without traumatising the tissue. In order to retain a bubble-free, mixed impression material, special mixing cannulas were developed. Using the spiral-shaped structures on the inside of the cannula, base material and the catalyst are dosed in the exact same amount and equally mixed together without air pockets. In the end, the impression material can be placed directly in the impression tray, sulcus or on the teeth. 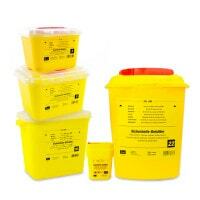 For disposing of the syringes and hypodermic needles, we offer you various sharps bins with differing volumes. These sharps bins are puncture-proof and have a practical stripping aid in the opening. This allows the used needles to be removed from the syringe using one hand and greatly minimising the risk of needle stick injuries and cuts. Suture material and single-use instruments, like scalpels or scissors, can also be conveniently and securely disposed of into a sharps bin. The full sharps bins can be securely and permanently closed for final disposal. 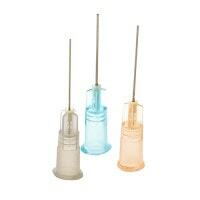 Praxisdienst offers you a comprehensive assortment of syringes and hypodermic needles for dental use. Here, you will find the proper single-use syringes, with a Luer or Luer-Lock connector, as well as the colour-coded, single-use cannulas to meet your needs; all at affordable prices. Do you have questions, need advice or are looking for a specific product? Speak to us per telephone, email or chat and our friendly customer service agents will assist you.